Here’s the typical situation. Your son or daughter want you to buy them a drumset so they can learn to be a drummer. They won’t stop bugging the heck out of you about it. They beat on everything too. You aren’t sure, but think they might have some talent. They can’t wait to try their luck at playing the drums. Before you wander into a music store to make that purchase, it’s best to think of a few things. First, if you aren’t sure how serious your new student is, it pays to be cautious. It’s not a small investment and you might end up with an expensive piece of decor in your living room that may not fit and they don’t use it anymore. 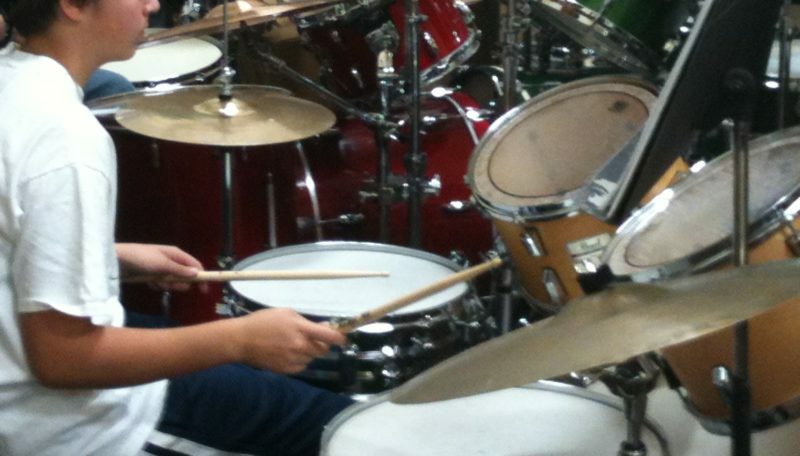 In this case, it’s always a good idea to explore having them take drum lessons. There is a reason they require training on many activities. Driver Education and Hunter Safety are two great examples. Think of it. How much can they learn on their own without professional guidance. How will your new drummer do in their first band? Without training they will either follow the band (which isn’t how drummers function) or hinder and maybe even destroy the chances of success for the band. Faking it by ear will only go a little ways. They could have a bad experience and decide to quit. Then you are stuck with a drum set. Second, research when your student really needs a drum set. In drum lessons most teachers start with a drum pad, book, and sticks. It is a more reasonable investment and fits most parents’ definition of a moderate expense for a child trying a new activity. A more qualified student is more apt to earn a drum set with practice. They will probably keep playing a lot longer. A good teacher will actually start on drum set lessons after some basics are covered and before you have a drum set. Drum Set Rentals are also another option, although most stores don’t rent drum sets since they are easily damaged, cost a lot to repair, then are used so they will lose a lot of value quickly. Face it, they are being hit with drum sticks all the time. Rent to Own is an option, but you will usually pay more than the retail price of the drum set when you finish your payments. Third, when it’s time to buy their first drum set you need to decide if you want to start with an Entry Level (Beginner) drum set until you want to upgrade. It might be fine to start out on a Beginner Drum Set and then when the student knows the difference in quality with more expensive equipment you and they can negotiate if and when it’s time to invest more. They might also buy it themselves when they have a job. A Difficult Lesson for Me, and a very discouraging lesson one was long ago when I started playing drums as a sixth grader. I thought as a beginner I “just had to have a drum set” to learn to play the drums. I finally convinced my parents. In our large family funds for this sort of purchase were very limited. Much to my surprise they approved my wish. Then they said “get in the car and we’ll go to the Bank.” When we arrived, They explained that I could buy a drum set if I paid for it. They helped me secure a loan for my drum set. Then I had to get a job to pay for it. Once all this was working we ordered the drum set. When it arrived “I was so excited I couldn’t wait to play it!” It was fun for a while until I ran out of things to try and noises to make. The need for a Qualified Teacher became apparent very soon.It was the only way to progress. My parents asked my band director who was best and we set up weekly drum lessons. It was worth the wait. Since I had worked hard through the basics, I understood the wisdom in his rule. I never realized the Patterns, Rudiments and Reading were the basics of playing drum set on every song. Since I could read and my coordination and hands were more skillful, I could accomplish the feat of mastering drum set beats and fills quickly and easily. I learned mountains of information on the drum set in no time at all. Then I learned another hard lesson about drum sets. When school started it was time to take my drum set to school to play with other drummers. I was so proud when I set mine up by the others. All the drum sets were shiny and bright. When I started playing on it I noticed it sounded much different. It sounded cheap. I tried and tried but I couldn’t adjust the tuning to match theirs. Then in trying to adjust things I broke a few of the metal parts. I discovered that the metal used to make my drums was cheap and not tempered. The plastic drum heads didn’t sound good and developed dents and before long they broke. Repair costs were a lot. When I asked the other drummers about their drum equipment I found out they had spent about twice what I had on their drum sets. The wood drum shells, plastic drum heads and metal parts in their drums had a huge impact on how good they sounded and how long they lasted. Theirs didn’t dent and break like mine and they sounded much more resonant with great tone. No one could tell the difference just by looking at them. They all looked shiny and bright just like mine. Soon I was embarrassed to have my new drums and I hadn’t even payed off the loan I made to buy them. After the lengthy time working and paying off my loan, I traded my drum set in on a more expensive brand like I should have bought in the first place. I learned that lesson the hard way. Never again. My first buying experience in drums and percussion equipment taught me a rule I learned and have followed since. How much you spend depends how long you will keep it. I never thought about the future of being a drummer when I started, and I’m pretty sure my parents weren’t sure either. All they wanted was an activity I could call “my own.” Since I have played on drums most of my life I am glad my parents had the wisdom to help me learn these valuable lessons about the value of a great teacher, great equipment and the work one invests to have them. They make all the difference.